In our technology-rich society, having to wait for anything goes against the grain. We have grown accustomed to sending a quick text and having an immediate answer. To sending an email instead of a letter and receiving an answer the same day. But this isn’t how God’s kingdom works. One thing I’ve learned in almost forty-five years as a Christian is that God seldom works on our timetable. Are you in a season of waiting for God? If so, you are not alone. Our family has been there as long as I can remember. The thing we’re waiting on changes, but the object of our waiting remains the same. We are waiting for God to work on our behalf. So when I saw the following quote from a Bible study I’m currently doing it caught my interest. 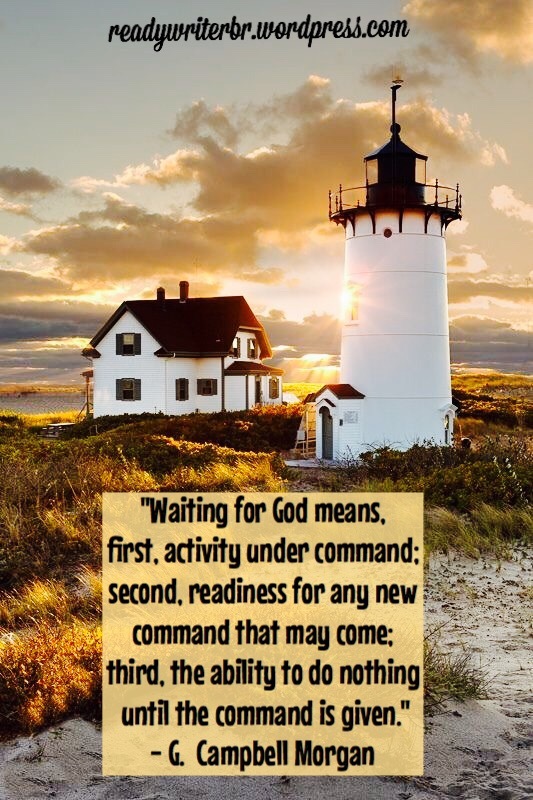 Such a concise definition of what it means to wait on the Lord! The underlying truth of this discipline of waiting is the Lordship of Jesus Christ: we are “under command” so we are not free to live anyway we want. To wait on God is to wait for His next command, asking Him to speak to us and doing nothing to resolve our current problem until we hear from Him. Yet, while we leave the issue of our wait in God’s hands, this doesn’t mean a time of waiting is a time of inactivity. During our current time of waiting on the Lord to provide a dependable vehicle for our family, I’ve been asking God what He wants me to do. I believe He was shown me four steps to take, the first three coming from doing a study of the Hebrew word qavah, usually translated wait in the Old Testament, which gave me a deeper understanding of what it means to wait on the Lord. The root word for qavah means to bind together, as the fibers of a rope are twisted and bound together. When I read this, I saw it as a picture of our lives under the Lordship of Jesus. As the fibers that make up a rope are twisted together to the point where separating them is nearly impossible, we are to be similarly intertwined with the Lord Jesus Christ. This is especially important during times of waiting. Another meaning of this Hebrew word is to wait expectantly or with hope. Waiting on the Lord is to be done with an attitude of expectancy. As with most attitudes, this begins with a choice, a decision to hold onto hope regardless of what our emotions are screaming. The natural tendency for me during times of waiting is to give place to worry and fear. To wait expectantly is to stand against these emotions by frequently reminding ourselves of God’s character and the promises of His Word. A third meaning of qavah is to be strong, robust. I don’t know about you, but during prolonged periods of waiting on God to act, I don’t normally feel very strong. In fact, the opposite is true. My faith feels shaky, even though I’m trying to hold onto the sense of expectancy described above. This brings to mind the words of the apostle Paul, “But he said to me, ‘My grace is sufficient for you, for my power is made perfect in weakness.’ Therefore I will boast all the more gladly about my weaknesses, so that Christ’s power may rest on me.” (‭‭2 Corinthians‬ ‭12:9‬ ‭NIV)‬‬ Recognizing my own weakness, I lean on Christ’s strength! In addition to understanding what Scripture really means when it says to wait on the Lord, another thing that has helped me is meditating on Scriptures about waiting on the Lord. The following verses are some of my favorites. As we wait on the Lord to provide a dependable vehicle for our family, I am daily approaching God’s throne of grace with confidence, asking for His mercy, grace and help in our time of need (Hebrews‬ ‭4:16‬ ‭NIV). ‬‬And I’m also applying the above four keys to walking victoriously through this season. I still don’t know how God is going to answer our prayers, but my confidence is in His character and His promises. Are you also in a time of waiting on the Lord? If so, remain under the command of our Lord Jesus Christ. Pray and apply the above steps, which will help you walk victoriously through this season. The thing you’re waiting for may be totally different than my current need, but no matter what is the subject of your wait, make the Lord the object of your wait.